Scharf was actually abroad between October 1845 and October 1847. It seems that soon after his return, flush with confidence from the Lays, he arranged to be photographed at one of the best studios in London – rather as when visiting Paris in 1867 he made a point of sitting to Nadar (see ‘All known portraits’). The Kilburn daguerreotype is the first known photograph of Scharf and one of the most flattering portraits in the iconography. 1) The first edition had been published in Oct. 1842. It was enormously successful and went into many editions: 18,000 copies were sold by 1852 and over 100,000 copies by 1875 (L. Stephen, ‘Macaulay, Thomas Babington, Baron Macaulay (1800–1859)’, DNB, London, 1893). 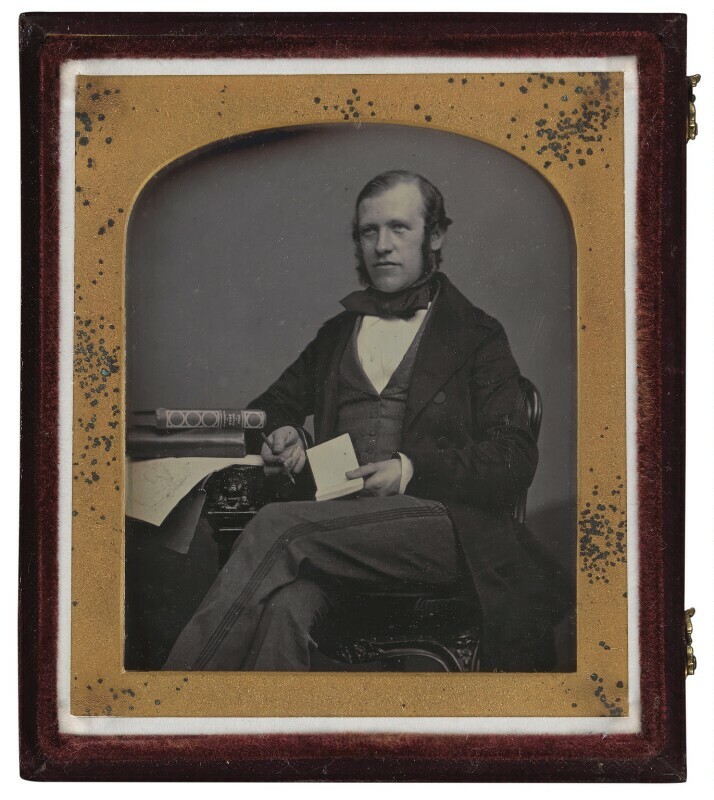 2) See Sir George Scharf Papers (Personal diaries 1845–7, NPG7/3/1/1, NPG7/3/1/2, NPG7/3/1/3, NPG Archive). 3) For a discussion of Scharf and photography, see Rogers 1989, pp.9–11. 4) In Apr. 1847 Kilburn photographed Queen Victoria and Prince Albert in a greenhouse at Buckingham Palace. He won the Grand Prize for Daguerreotypes at the 1851 Great Exhibition. See NPG NoP (Kilburn). 5) See NPG Annual Review 2000–1, p.39. No documentation in NPG RP P859. Three-quarter-length, seated to left, head three-quarters to left, sketchbook in left hand and pencil in right, two books and a map on table at left. Transferred to the Primary Collection from the Photographic Collection, November 2000. Rogers 1989, frontispiece (not exhibited). Hulme, Buchanan & Powell 2000, p.19.